Access Cover Art by clicking the tab with the icon. When you click the tab, Cover Art will automatically begin searching your digital music library for songs missing the album cover art. Upon completion of the search, Cover Art will display all albums missing cover art. The top portion of the viewable displays the "selected" album from the list below, denoted by the "blue" color. The four "thumbnails" represent different versions from which you can choose your final selection, which will appear as a larger image at the top - the "selected artwork". You can click the "Save" button beneath the "selected artwork" for the single album that is selected in the list. 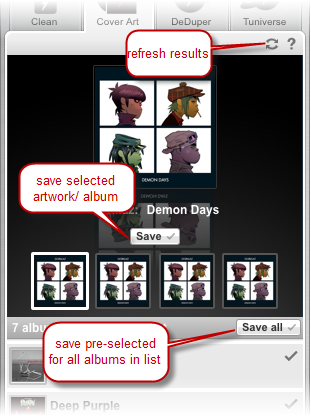 You can click the "Save All" button in the list, which will save the pre-selected artwork (which is displayed in the list) for each album where missing album art was detected. Clicking the (refresh icon) will refresh the results by re-initiating the search for missing cover art within your music library. 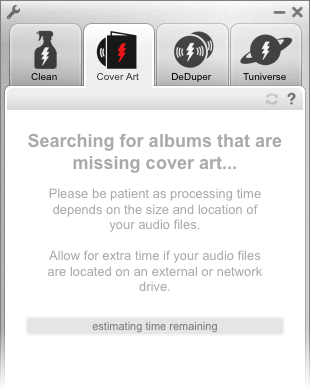 If you haven't used TuneUp in a while, and you access Cover Art, it is a good idea to refresh the results. See also "How It Works" on our website.